It was 1 year ago today, that the price of bitcoin peaked at $19,891. Five days later, the price tumbled to $10,400. The next high on January 7th reached $16,841, before the price tumbled to the February low at $5873. There have been ups and downs since that time but despite the $226 gain today, the digital currency has lost -82.76% of it's value in the last year. The low was reached on Saturday at $3128.89. Moreover, confidence has been sapped away from investors. The euphoria and bullish sentiment from 2017, has been replaced with quiet and a consistent bearish sentiment in 2018. The price has been below its 200 day MA since March 14th. 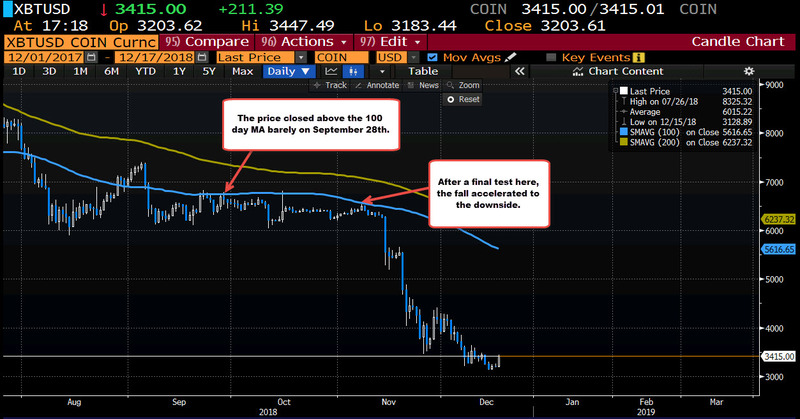 More recently, the price has been below its lower 100 day MA since September 28th and only above the 100 day MA on 1 day since September 6th. 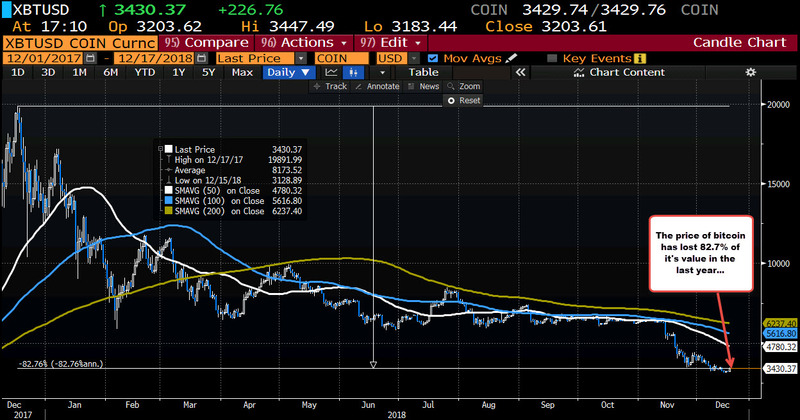 With the price currently at $3414, the price is $2002 below its 100 day MA at $5616. That is a big gap between the MA and the price. Buyers turned to sellers over that time period, screaming GET ME OUT. 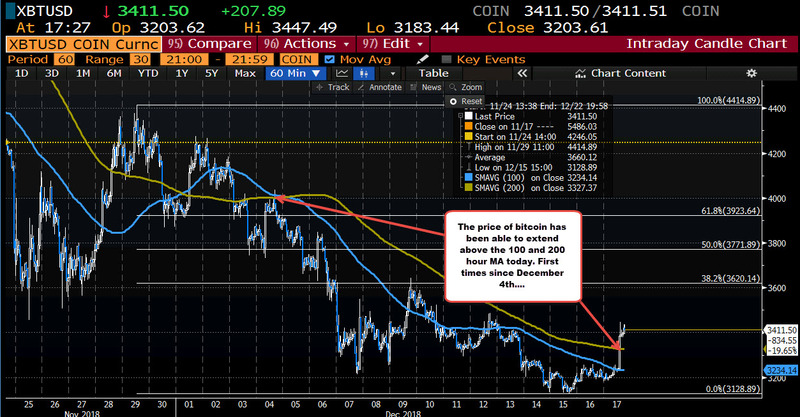 A glimmer of hope one year from the peak, is that today, the price has moved above its 200 day MA for the first time since December 4th, after reaching a new 2018 low on Saturday at $3128.89. For traders, stay above that MA is a flicker of light in what has been a lot of darkness for the owners of bitcoin. Maybe the big holders of bitcoin added more today to counteract what was likely to be a painful and forgettable anniversary. The marriage and love affair that made bitcoin the love affair of the century in 2017, is heading toward the divorce court in 2018.